Genuine OEM Brother Toner Cartridge, Black, 2,500 page yield. 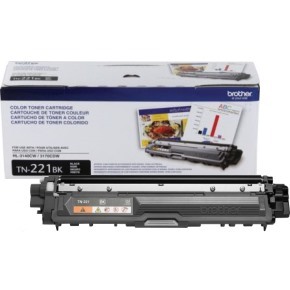 Brother part number: TN221BK. Laser Toner Cartridge compatible with Brother DCP-9020, HL-3140CW, HL-3150, HL-3170CDW, HL-3180CDW, MFC-9130, MFC-9140CDN, MFC-9330, MFC-9340. The product works great! Everything prints perfect. No complaints. Compatible Brother Toner Cartridge, Black, 2,500 page yield. Replaces Brother part number: TN221BK. Laser Toner Cartridge compatible with Brother DCP-9020, HL-3140CW, HL-3150, HL-3170CDW, HL-3180CDW, MFC-9130, MFC-9140CDN, MFC-9330, MFC-9340. Compatible Brother Toner Cartridge, Cyan, High Capacity 2,200 page yield. Replaces Brother part number: TN225C. Color Laser Toner Cartridge compatible with Brother DCP-9020, HL-3140CW, HL-3150, HL-3170CDW, HL-3180CDW, MFC-9130, MFC-9140CDN, MFC-9330, MFC-9340. Compatible Brother Toner Cartridge, Magenta, High Capacity 2,200 page yield. Replaces Brother part number: TN225M. Color Laser Toner Cartridge compatible with Brother DCP-9020, HL-3140CW, HL-3150, HL-3170CDW, HL-3180CDW, MFC-9130, MFC-9140CDN, MFC-9330, MFC-9340. Compatible Brother Toner Cartridge, Yellow, High Capacity 2,200 page yield. Replaces Brother part number: TN225Y. Color Laser Toner Cartridge compatible with Brother DCP-9020, HL-3140CW, HL-3150, HL-3170CDW, HL-3180CDW, MFC-9130, MFC-9140CDN, MFC-9330, MFC-9340. Compatible Brother Drum Unit, Cyan, 15,000 page yield. Replaces Brother part number: DR221C, DR221CL Cyan. Drum Unit compatible with Brother DCP-9020, HL-3140CW, HL-3150, HL-3170CDW, HL-3180CDW, MFC-9130, MFC-9140CDN, MFC-9330, MFC-9340. Compatible Brother Drum Unit, Magenta, 15,000 page yield. Replaces Brother part number: DR221M, DR221CL Magenta. Drum Unit compatible with Brother DCP-9020, HL-3140CW, HL-3150, HL-3170CDW, HL-3180CDW, MFC-9130, MFC-9140CDN, MFC-9330, MFC-9340. Compatible Brother Drum Unit, Yellow, 15,000 page yield. Replaces Brother part number: DR221Y, DR221CL Yellow. Drum Unit compatible with Brother DCP-9020, HL-3140CW, HL-3150, HL-3170CDW, HL-3180CDW, MFC-9130, MFC-9140CDN, MFC-9330, MFC-9340. Compatible Brother Drum Unit, Black, 15,000 page yield. Replaces Brother part number: DR221K, DR221CL Black. Drum Unit compatible with Brother DCP-9020, HL-3140CW, HL-3150, HL-3170CDW, HL-3180CDW, MFC-9130, MFC-9140CDN, MFC-9330, MFC-9340.